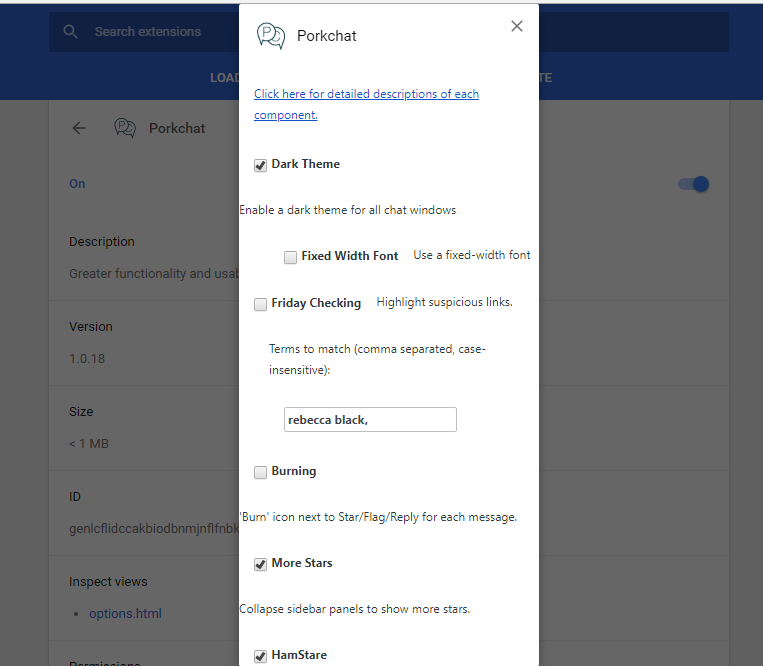 Porkchat is a Chrome extension that bundles together a lot of scripts I have written for Stack Exchange chat over the years. It is fully configurable - each individual script can be enabled/disabled from the options page. 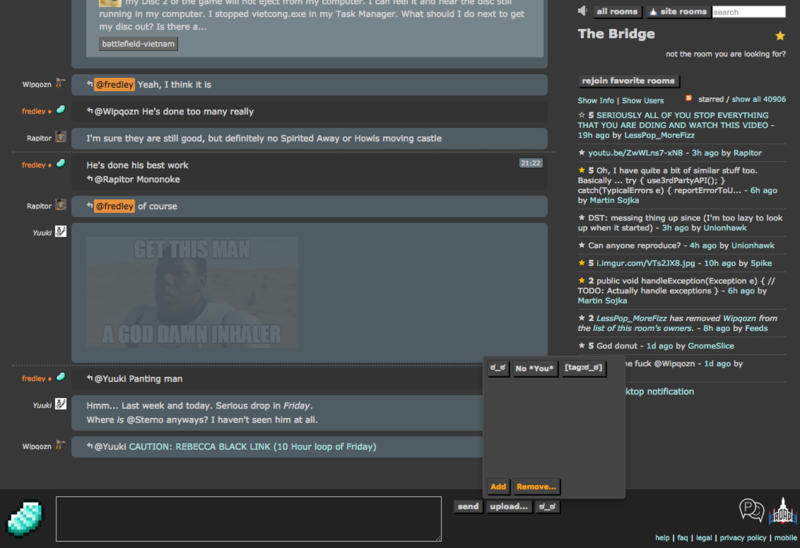 Dark Theme - A comprehensive light-on-dark theme, inspired by solarized. More Stars - Links to persistently show/hide sidebar panes to allow more room for the star list. Good for small screens. PONIES (image hider) - Images and YouTube previews are shown with 0.1 opacity unless moused-over. Drag+Drop Upload - Upload images to chat just by dragging and dropping files onto the chat window at any time. Images are not automatically posted, allowing you to edit the message (e.g. making it a reply) before sending. Room Topic Change Diff - If the room topic changes the topic change message is edited showing the previous and new topic, so you can see the changes. HamStare (Quick text menu) - Adds a menu for quick text shortcuts. Friday Link Highlighter - Avoid Rebecca Black's hit single - links are highlighted, and this script checks redirects so can detect links behind shorteners. Message Burner - Adds a button to 'burn' away messages you don't like, hiding them with an animation. 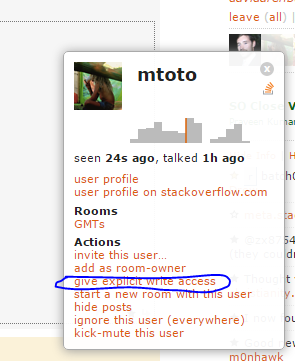 Mod goodness - whois autocompletion for TL, edit deleted messages, give users write permissions from within a room. All of these scripts are already available here on stackapps as individual userscripts, so why the extension? Fast loading - the loading of all these scripts, if you use more than one or two, is vastly streamlined. Contribute - Porkchat is open source and hosted on github. There are more options below "HamStare", but they are inaccessible. A scroll bar is not there as well. I suspect this is due to Chrome defaulting to "chrome_style": "true" in the manifest.json, and I think a simple CSS fix would be to just set the proper width and height properties. A quick test with width: 1000px; on <body> did the trick. Most importantly, the "Save" button is hidden, and I was unable to get to it through overflow: scroll. Not the answer you're looking for? Browse other questions tagged script chrome-extensions chat . Why API Version 2.2 returns null always while getting questions list?